The Art Gallery of New South Wales is delighted to announce the winners of the sixth annual Young Archie competition, which celebrates the talent of budding young artists from around Australia. In the spirit of the iconic Archibald Prize, the Young Archie competition invites children and teenagers aged five to 18 to unleash their creativity and submit a portrait of someone who is special to them and plays a significant role in their life. Entries were judged by guest judge Abdul Abdullah, a leading Australian artist and four time Archibald Prize finalist and three time Sulman Prize finalist with Victoria Collings, Art Gallery of NSW community engagement manager. “This year’s winning portraits all offer compelling insights into the relationships and perspectives of our young artists. They also demonstrate impressive creativity and very importantly, self expression,” Abdullah said. “This is the second year I’ve judged the Young Archie competition and it continues to fill me with excitement to experience the creativity of young people, and possibly the next generation of Australian artists,” Abdullah added. Part of the family program for the annual Archibald, Wynne and Sulman Prizes exhibition (12 May – 9 September 2018) the Young Archie competition is a much loved part of the Gallery’s calendar. Maud Page, deputy director and director of collections at the Art Gallery of NSW, said the Young Archie competition highlights the Gallery’s continued commitment to fostering the creativity of children. “It’s incredibly inspiring to see children and families so engaged in the Young Archie competition which attracts entries from across Australia. 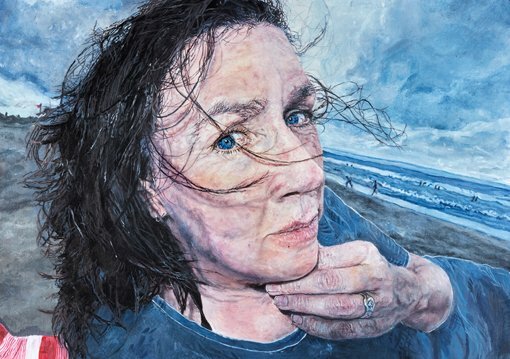 The exhibition of the finalists and winners’ works is a highlight of the annual Archibald Prize where they are enjoyed by thousands of visitors,” said Page. The Young Archie competition is proudly supported by presenting partner ANZ. This year ANZ has extended its support of the Young Archie competition by increasing the prize money for finalists and winners. Young Archie finalists receive a cash prize of $50 and the four winners each receive a cash prize of $200, an increase of $100 from past years. Finalists also receive an art pack from S&S Creative and an Archibald 18 catalogue. Age category winners are also awarded an art pack from S&S Creative, an Archibald 18 catalogue and a family pass to a paid exhibition at the Gallery. Fred Ohlsson, ANZ group executive Australia congratulated the winners and finalists of this year’s Young Archie competition. “The Young Archies provides a stage for the artists of tomorrow and an opportunity for young talent to be nurtured and celebrated. As presenting partner, ANZ is proud to support the next generation of Australian artists and we are delighted to continue our long history supporting the arts and community in New South Wales,” said Ohlsson. Finalist works are on show at the Art Gallery of New South Wales as part of the family program for the Archibald, Wynne and Sulman Prizes exhibition until 9 September 2018. Artworks with an honourable mention are displayed at the SH Ervin Gallery in The Rocks, alongside the Salon des Refusés 2018 exhibition.